Product weight is 2.5 lbs. All-new arcade release of the DDR series hits the PlayStation 2 including dance mat * Awesome soundtrack packed with major hits and brand new songs * Enhanced online support offers 4-player multiplayer * EyeToy Supports for PS2- use your hands and feet and see yourself on TV * Sequel to the biggest and best DDR game to date The hottest revolution and bestselling video game in the music game category explodes onto the dancefloor with Dance Dance Revolution SuperNOVA2, the follow up to 2006's biggest and best DDR game to date. Bundle version includes the dance mat. This was bought as a Christmas present for my 15 year old..Her college age sibling came home for the holidays..and the competition was on....It only comes with one pad...so the kids went searching for an additional one. All of us including the adults ended up bring the new year in playing DDR.. We started around 6pm and it lasted until around 12:30 am..What a blast...Mom, Dad and the littlest started on Beg-Beg and Stand-Beg and the older kids started on Standard-(Basic/Advanced)..If you have more than one.. THIS GAME IS FANTASTIC!!!!! My 8 year old son requested this for Christmas. Since Santa was bringing him a PS2, we figured, why not? The price was very reasonable.You plug the mat into the PS2 console, put in the disk and you are ready to dance. Starting out in the game mode was rather intimidating to him. If you don't hit enough moves exactly on the mark, you are "boo'd" off the stage. Needless to say, he gave up after four or five tries. He's a little sensitive to criticism. DON'T GIVE UP! THERE .. I'm no ddr master, so take this review with the noob view that is written with lolI bought this bundle because I had no mat, no game, and still had a working ps2 around, and this was on sale. 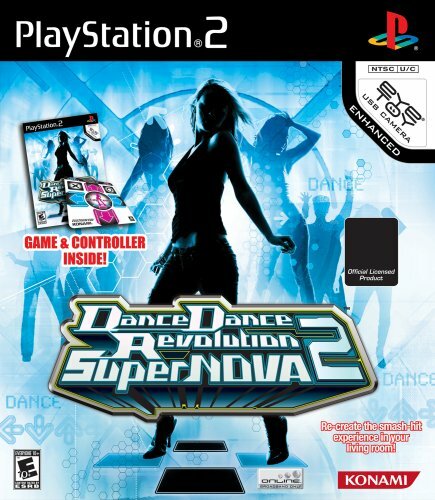 I was searching for a ddr set and heard good things about supernova1, so purchased it, on sale. PS2 has the most ddr's on any console, and the ultramix3&4 for 360 got such terrible reviews, I think my supernova2 purchase was a good one.My total virgin experince ddr'ing has been good so far with this set. The songs are ..
Erin (France) - See all..